Did You Know? Auroras on Satellite! Sorry for the recent period of inactivity; working evening have really cut into the blogging time. Tonight I wanted to introduce a new type of post. The Did You Know? posts will cover an even wider range of topics than usual and will typically be short and sweet. They will bridge the gap between the typical post and the typical tweet. I hope you enjoy them, and as always feel free to e-mail me with any comments or questions. Did you know that auroras can be seen on satellite images? 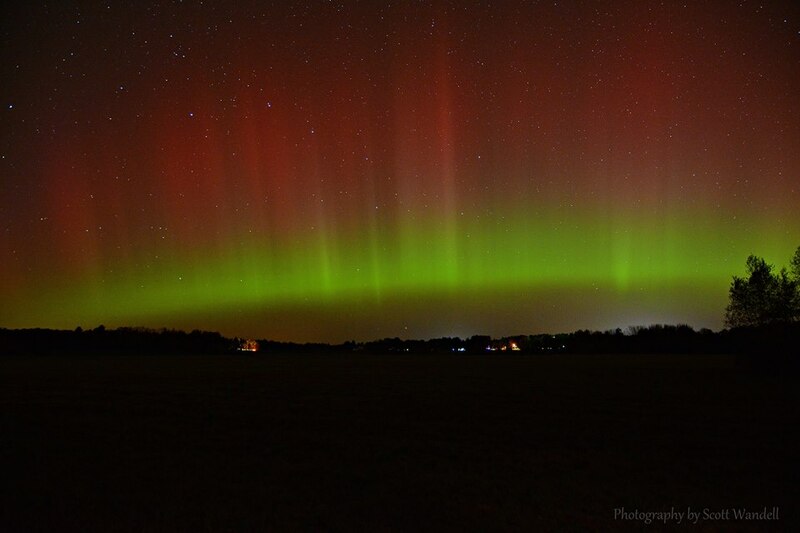 This picture was taken last week on the 8th near the Grey, ME NWS office. It’s the aurora borealis, or the northern lights. Auroras occur at both poles (called aurora australis for the South Pole) and are caused by energetic particles from the sun interacting with the Earth’s magnetic field. The particles ride the magnetic field lines down to the poles and excite nitrogen and oxygen molecules in the atmosphere. The Earth’s magnetic field lines. When the auroras reach the lower 48 it’s typically the result of a coronal mass ejection, a solar storm that releases a truly massive amount of particles. I could go on because astronomy is another one of my real passions but this is supposed to be short and sweet. For great info on CME’s that isn’t blocked by the current government shutdown, check out this NASA page. 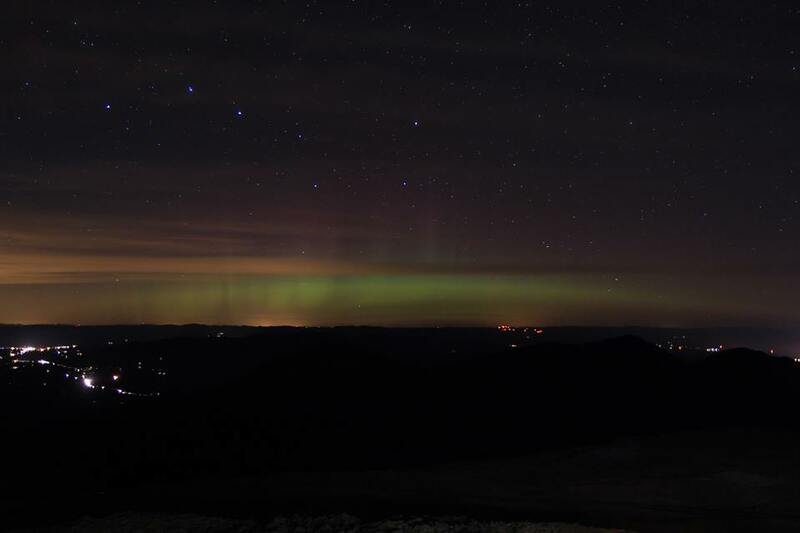 The aurora, as seen from the Mount Washington Observatory in New Hampshire. Sure auroras are bright, truly amazing to behold, but I was still surprised when I discovered that they could be seen by satellite. So who (what) can spot them? It’s the Suomi Nation Polar-orbiting Partnership (Suomi NPP) satellite and it’s Visible Infrared Imaging Radiometer Suite (VIIRS). Launched October 2011, VIIRS is capable of seeing everything from phytoplankton to reflected moonlight. Included in the suite is a “day-night band” capable of picking up faint light sources at night. This is this tool that has allowed meteorologists to spot these auroras from above. The bright, looping features in the northern half of the picture are the auroras. Amazing! Look at those beautiful curtains of lights. What really jumps out to me is the shear size of them. 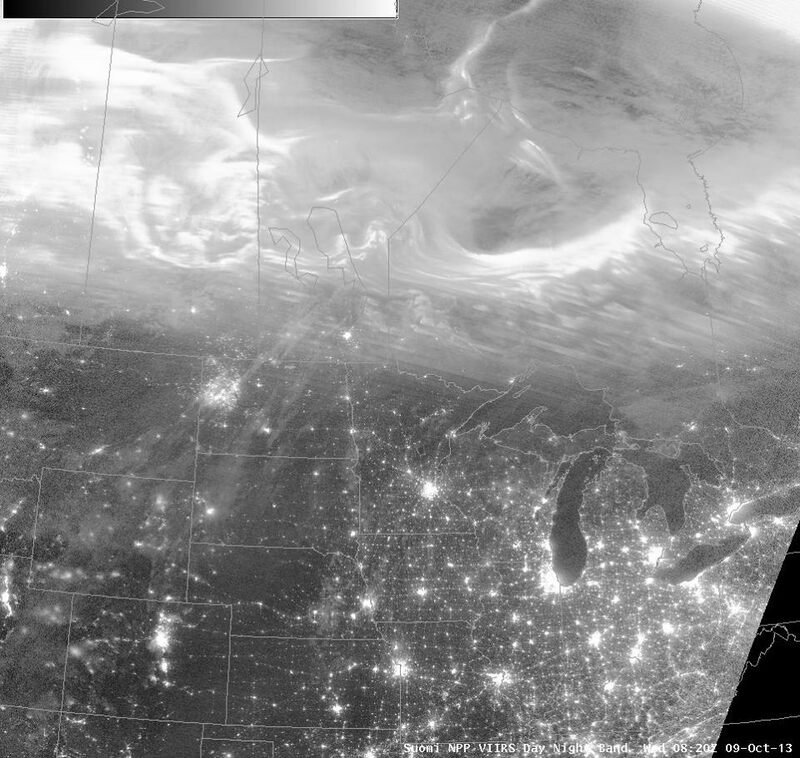 For more images just google VIIRS aurora. Pretty cool huh? Alright everyone, that’s it for our first DYK segment. See you next time!